The ugly data for oil – ugly for those who’ve been hoping for, and hyping, a quick rebound to Nirvana – keeps piling up. But for two months, the price of oil was immune to it, trading in a range of around $60 per barrel for the US benchmark West Texas Intermediate. It stirred up false hopes that lured yield-desperate investors into plowing more money into the industry, which allowed companies to raise many billions in new debt and equity capital so that the permanently cash-flow-negative business model of fracking could soldier on. OPEC, which is furiously fighting for market share, has no intention of cutting back production. While its limit has been 30 million barrels per day (bpd), reality has been making a mockery of it. In June, production rose 170,000 bpd to 31.28 million bpd, the fourth months in a row of increases, and the highest level since August 2012, according to Platts’ report released today. While some OPEC members experienced declining production and lost market share in June, Saudi Arabia increased production to 10.35 million bpd and Iraq added a phenomenal 330,000 bpd to produce over 3 million bpd. Output “seems to be on the way up, and at a time when the market could be looking at a lot more oil from Iran,” explained Margaret McQuaile at Platts. So add Iran to the OPEC mix. If negotiators of the six powers and Iran are able to agree to a nuclear deal this week – there are indications that they might – and if sanctions are lifted, Iran wants to nearly double its crude oil exports, boosting them from around 1.2 million bpd currently to 2.3 million bpd. It would put Iran on collision course with Saudi Arabia, and it would set the world markets up for a flood or Iranian oil. And for a majestic oil glut, as in the US, production is still soaring. The new money flowing into the US fracking industry and the $60-per-barrel price range that has been hyped as the survival price had the net effect that drilling activity picked up again, with the oil rig count rising for the first time since early December, after having plunged 61% since October. The supply glut in the US took on a chilling nuance when crude oil inventories rose last week, even though it’s driving season when inventories are supposed to fall rapidly. They remain at historic highs for this time of the year. Inventories are also high in all developed economies. Then there is that floating inventory, tankers full of crude oil, anchored off shore around the globe. This was the trade of the decade: buy physical oil while the price was low, sell futures at a higher price, deliver the oil when promised, and pocket the difference minus the storage costs. This trade now contributes in its manner to the greatest oil glut in history. 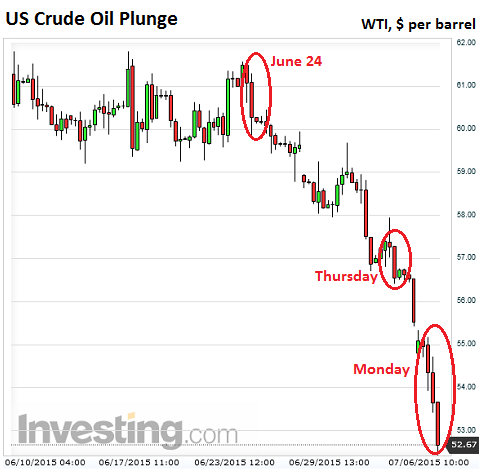 A miracle could stop glut, but miracles have become rare [read… Biggest Glut in Recorded Crude-Oil History Taking Shape]. Then there’s the demand side of the equation. Chaos in Greece that might bleed into parts of the Eurozone and the vastly more important collapse of the stock market in China have a potential to wreak havoc on demand. China’s economy has entered a hard landing. In its desperation, the government has encouraged consumers of all stripes to plow the maximum amount of borrowed money into the booming stock market to get rich quick, and then to spend these gains from the imaginary economy in the real economy, in order to goose GDP. It worked for a year. But three weeks ago, it began to collapse. Due to leverage, numerous of those small-time investors got wiped out. The problem for oil is this: China, with imports of 7.4 million bpd, became the world’s largest oil importer in April, ahead of the US. The International Energy Agency still expects it to account for 29% of global demand growth in 2015. All hopes rest on China! Now the worry is that demand for oil in China, given the sinking economy and crashing stocks, might get hit at the worst possible time. Even if demand in China just remains flat, it would be a fiasco for the desperately hoped-for growth in global demand. And what might happen if demand in China actually declines is simply too ugly to contemplate. Here’s a nice little article I found today from a day ago. Thought i’d share if you haven’t already seen. :) Cheers. The guy, Robert Wiedemer wrote a book predicting a crash in 2012. I am surprised he still thinks he understands America’s economy. He probably underestimated the central banks doing historic amounts of stimulus as well as most investors and businesses going along with it. It’s like watching a marathon full of Kenyan runners and waiting for them to get tired and stop. Yea I should have mentioned to ignore Robert Weidenner. Just about the billionaires pulling there money out of the stock market was of interest. What he gave was a range, i think 2014 to 2017 as I recall (it’s been a while since I read the book Aftershock). It’s important to remember that even if he gave 2012 as a specific date he technically would have been right. In the fall of that year the bubble was actually starting to burst. The only reason it didn’t was because of Fed intervention in the form of QE3, which reinflated the bubble and pushed everything to even greater extremes. So I’d still call that a win. Wolf, I honestly cannot explain my belligerent attitude, but it’s even more difficult to rationalize the lack of interest of the butcher, baker and the candle maker. They’re wearing this happy face as if white knights were on their way from Camelot to rescue us all in just the nick of time. I’m so putout with these types that I have to stay away from them because I can no longer stand the sight, sound and smell of apathy. The “butcher, baker and the candle maker” are not apathetic. They can see the rot in the system and know when the SHTF they will survive because they are the real producers and the backbone of the country/military. The paper pushing non producers will bear the brunt of the backlash. Even I can see that from way down here. Wolf,I am very perplexed & confused. Perhaps you can help me alleviate the confusion in my mind relating to the oil industry! If the oil industry is suffering from rock bottom prices due to a huge supply surplus……why is the price I pay at the pump for gas going up on a continuous basis? It couldn’t,perchance,be the result of collusion,conspiracy,& monopolistic practices on the part of the oil distributors & brokers? Who would have thunk it? If this keeps up I will need to start investigating the prices for hay & horse shoes. Great article Wolf. Regarding the question in comment above. The Saudis are intentionally trying to kill the price of oil. They are doing this to influence US policy in a number of key areas: 1) Get the US to bomb IRAN’s nuclear facilities. 2) Take out Assad in Syria. Saudi Arabia knows that the one thing the US fears most is price deflation. Oil prices plunging create huge price deflation. 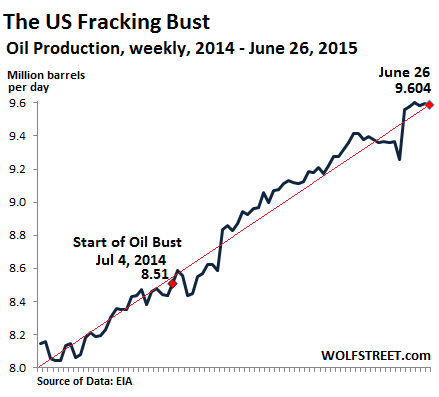 The second impact (secondary really) is the fracking boom in the U.S. The price of gasoline and oil in the US can be and is being held up by US economic puppet masters in the derivatives market……to a certain degree. However, manipulating ‘paper’ prices of a commodity can only be done within a certain range of fundamentals. In other words, gross fundamental supply/demand differences cannot be papered over indefinitely. After the first big drop, prices were manipulated up somewhat. I’m sure the US government was pulling out the stops to buy and store oil anywhere/everywhere to try and hold up demand. But once storage is filled and supply continues to outpace demand, prices will have to fall. The Saudis feel betrayed by Obama and his policy. They are right. Now to answer the question about gas prices. The US can and will hold up gas and oil prices to the maximum extent possible through forced coercion of the US oil companies. They cannot afford to let oil and gas drop significantly because of the severe deflation threat that would pose. So don’t expect US gas to drop much below it’s current price levels. Here in Ottawa the Gas is back up to 1.20 a L and 1.30 a L in Montreal. Which is where it was when the Oil was at 100 a Barrel. But doesn’t this have to do with Taxes? IE Carbon Taxes. They need cheap gas at the pumps if they ever want a true recovery do they not? Monday, it was reported that there is an investigation underway to that effect in California, where gas prices are even higher. I’m shocked and appalled. Indeed. Hovering just under $4 here in La La Land. Every time there is an “investigation” concerning retail gasoline prices in CA the conclusion is always the same: “Well, it’s California”. You might need to do some comparison using data/sites like GasBuddy.com to see if prices (in your mind) are a local, regional, or national issue. I live in a small-ish alaska town and our fuel tank farm is sized accordingly. When it fills up at a certain price, and the two owners/companies have booked/hedged orders for some months out, there can be wild swings in price nationally but we don’t see much because we have to eat what we stored at the price it was stored at so to speak. I have no doubt there is manipulation in prices at pretty much all levels, so don’t take this as a defense. The real question is how MUCH of the price is manipulation and how much is just lag due to a complex array of factors. If demand is off, stock is flowing more slowly through tank farms, shipping/trucking, and refineries, so this enhances the lag. Personally I am of the opinion that everything is so screwed up I don’t think anyone knows what anything is really worth right now … and that is really the central course on the dinner table for all of us to eat. Price discovery will set in at some point and it won’t be pleasant! Pretty simple really: $70/barrel and above starts killing economies…….$70/barrel oil and below starts killing oil companies. Considering production of crude and condensate peaked in 2005, and what is nowadays tossed into the oil barrel and called oil by media (refinery gain, ethanol, bitumen, bio-diesel, and the light by-products from tight shale) is not really what the public thinks is the Jed Clampett black gold of the past. We are entering a new phase of reality. Get used to declining growth and massive changes. Debt has been substituted into the game these past few years in place of cheap energy to keep the goose honking and profits (for a few parasitic banksters) increasing. $60 oil is still way way pricier than the almost free energy of the past. Reality started to bite when North Sea petered out. US still imports +40% of its energy needs and will never be energy independent. It could be with a population 1/3 of what it is, but that isn’t likely. Energy is too expensive….debt is not energy…and since growth requires actual energy to do the work, the future is starting to look a whole lot different than what folks think are normal lifestyles. Having less of everything will be the new game in town. How many years will it be when people throw bricks through Hummer windshields as a symbol of where we lost our way? I look forward to a time when banksters are afraid to go to work and simply disappear from ‘polite’ society. Aha, I figured at some point the peak oil doomsayers would come out of the woodwork. Sorry but you’re wrong, every so often we go through these commodities supercycles and with that comes dire warnings from “experts” that we were in imminent doom of major resource depletion and we would all have to learn to live with less. And these prophets are wrong wrong wrong all the time. Don’t forget that we have 9 years of oil left……starting in 1919. Labels, labels, labels. That’s funny, but debunking articles (themselves many-times debunked) don’t begin to explain how the global economy can grow infinitely on this rather finite planet. That global economy has at it core a requirement to grow, otherwise it fails. Oil extraction/energy production cannot grow anymore and the economy it powers must follow suite. Why is this such a difficult concept?? Obama’s plan to crash the US economy continues apace. By systematically betraying both domestic and foreign promises chaos increases, and no one can plan for anything other than short term. Russian bombers have twice approached within 200 miles of our borders, the VIX has surged, Greece is hammering Europe, the SCOTUS has folded twice like a cheap suit, China is collapsing and now oil has crashed again. The next move is for China to depeg and dump a glut of cheap trade goods on an unsuspecting market, taking out anyone still holding on by the skin of their teeth. What did you expect from closet socialist? Of course he wants to destroy great USA and buy votes via EMT cards/food stamps, Obozo phones, welcome the illegal aliens for future votes, etc. HOAX we can believe in! The glutted oil market may be responding to the news that Iran will sign the damned nuclear deal ushering in more supply further depressing the oil price. And joker Kerry will act like modern day Chamberlain who was giddy after joke agreements with Nazi declaring rather very short lived peace in Europe as we ALL know the nuclear agreement signed is like TP (toilet paper) and gives Iran revive its moribund economy while running the centrifuges tucked underground in military complexes. Yep Iranians will cheat just like the North Koreans. Commodities are all moving in the same direction…..down. The rest of the casino should not be that far behind. 1. OPEC wants to destroy the competition (bad for US fracking, shale, and Canadian tar sands). 2. Saudi Arabia is doing a favor for the US by hurting Russian oil export profits. However, couldn’t another reason for the OPEC refusal be one I haven’t seen stated – that OPEC doesn’t want the golden geese (it’s oil importing customers) to come down with a very serious disease and is trying to forestall a huge economic crash by greatly lowering energy costs for now as a favor to everyone including themselves?